These videos, originally part of the Cochrane Learning Live webinar series, give an overview of the available methods for estimation of the between-study variance and its corresponding uncertainty, as well as for calculating confidence intervals and prediction intervals for the overall effect size. Simulation and real-life data studies that compare the methods are summarised, and it's indicated whether some methods are preferable than others by considering the published comparative results. Finally, potential issues surrounding the computation of prediction intervals under the random-effects model are discussed. 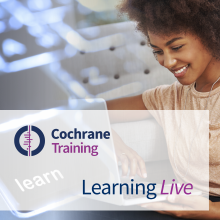 The webinar was organized by the Cochrane Statistical Methods Group, with support from Cochrane's Membership, Learning and Support Services. The webinar was delivered in October 2018. Below you will find videos from the webinar along with the accompanying slides to download [PDF]. Dr Areti Angeliki Veroniki is a Research Fellow at the Department of Primary School Education, University of Ioannina, Greece, a Research Associate Statistician at the Institute of Reproductive and Developmental Biology, Department of Surgery & Cancer, Faculty of Medicine, Imperial College, London, UK, and an Affiliate Scientist at the Knowledge Translation Program of St. Michael's Hospital in Toronto, Canada. Her research focuses on the statistical modelling for knowledge synthesis and the methodology of systematic reviews. She is a Convenor of the Cochrane Statistical Methods Group (SMG), an Associate Editor for the BMC Systematic Reviews journal and the BMC Pilot and Feasibility Studies journal, and a Statistical Editor for two Cochrane groups: the Cochrane Depression, Anxiety and Neurosis Group (CDANG), and the Cochrane Developmental, Psychosocial and Learning Problems Group (CDPLPG).